Iris is an innovative, sample-based synthesizer that empowers you to create musical sounds like never before. Start by layering up to four distinctive audio samples, then use the spectrogram display and selection tools to spotlight the most interesting spectral characteristics. Still hungry for more? Add attitude, dimension, and depth to your creation by applying iZotopeʼs world-class effects: chorus, reverb, delay, distortions, ﬁlters, and more. Or modulate more than one hundred parameters through a simple, single-click-and-drop assignment system. 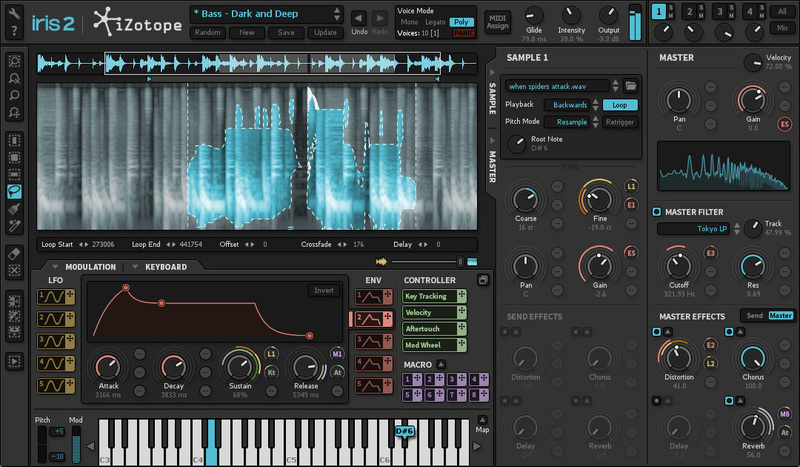 Tweak your sounds deeply with Iris 2ʼs diverse and intuitive spectral selection tools. Iris 2 makes it fun to experiment and manipulate your selections even further, with additional controls for zooming, inverting, and more. Spectrogram display: Visualize the frequency content of your audio and discover sonic details a traditional waveform doesn’t show you. Spectral Filter: Draw your own unique filter shapes and isolate specific frequencies to discover new sonic possibilities in your sample library. Selection tools: Use a lasso for free-hand drawing of any size or shape, an adjustable brush for more ﬂuid selections, and a magic wand for intelligent selection of harmonic regions. Bring movement and expression to your sound with dynamic tremolo effects, expressive vibratos, and radical filter sweeps, all easily synced to your host tempo. Apply up to five adjustable-curve ADSR envelopes as well as five LFOs with dozens of morphing wavetable options. Over 100 modulatable parameters: Sculpt your signature sound using up to five LFOs, five Envelopes, MIDI Expression Controllers, and Macro Controls. Envelopes: Advanced ADSR envelopes let you creatively experiment with your amplitude through adjustable curves, draggable nodes, invert mode, and modulation of all four parameters. LFO: Morph and visualize shape changes with real-time animation. Our LFOs contain 20 different wavetable types, each with multiple shapes and a modulatable control to move between them. MIDI controllers and Macro controls: Attach MIDI expression controls like key tracking, velocity, aftertouch, and the mod wheel, and save assignments with your patches. Create Macro controls to control multiple parameters with a single knob in perfect proportions. We’ve optimized Iris 2 to be an instrument that helps inspire creativity and introduce new possibilities into your musical process. Each knob, button, panel, feature, and workflow has been reviewed with input from dozens of artists and users. Redesigned interface: Find the right tool at the right time with a completely redesigned interface. Choose from a comprehensive all-in-one view, or hide/undock modules for a more streamlined view. Macro Controls: Quickly access and assign macro controls for easy customization of your sound. You can control them via the Patch Browser as well as an undockable window that can always be open. Visualizations: See the effects of modulation and filters in real time for every modulated parameter. Visualize your spectral content with a spectrum analyzer from our award-winning Insight metering suite, included right in the master section. Intelligent Zero Crossing: Loop sample selections seamlessly using our new Intelligent Zero Crossing technology. Expand your sound palette with hundreds of exclusive musical patches from world-class sound designers and 11 GB of audio samples. Get inspired by the sounds, then explore new sonic territory. It’s easy to create or discover something totally new, just by tweaking a few controls. A broad variety of soundscapes, pads, synth, bass, and lead patches can be creatively altered for adventurous sonic exploration—from soaring leads, ethereal choirs, and percussive effects to pulsing tones, lush chords, and ominous growls. 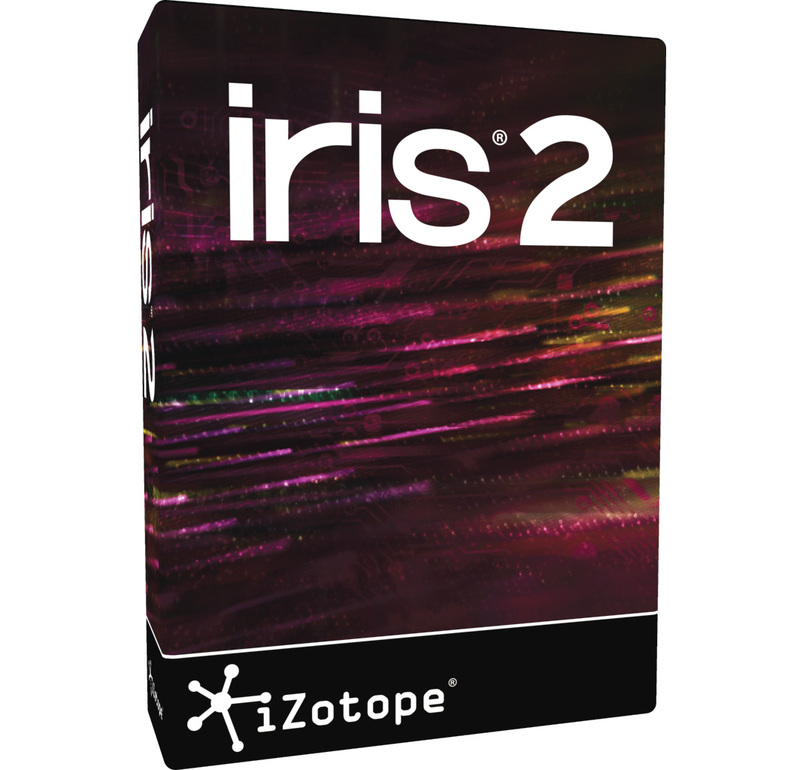 After you've installed and authorized Iris 2, you can access this epic library of sound by logging into your iZotope account and downloading the installer(s). Abstract: Add an element of intrigue to your project with the Abstract sound library. Sample categories range from Pulses, Rhythmic, and Sweeps to FX and Production Elements. Add a “Haunting Drone” or “Granular Torching” to your track and transport your listeners to a brave new world of truly unexplored terrain. Environments: From bustling casinos to sci-fi soundscapes, Environments provides a diverse collection of ambiences ready for musical adventures. Load one of the samples and start tweaking instantly, transforming the familiar to the unique and the mundane to the mysterious. Environments is ideal for finding inspiration for your next track or production product. Instruments: Standard musical instruments are not always what they seem. Rediscover new beauty and intrigue within familiar sound sources through the Instruments library. Instruments takes what you know and makes it fresh again by uncovering unconventional timbres and tones—bringing something special to the run-of-the-mill piano, guitar, and bass sounds you’re used to. Objects: Explore the inherent sonic possibilities of objects—some everyday, and some not-so-everyday—in a musical and meaningful context. The resulting sounds are inviting, uplifting, and unusual. Objects is an eclectic collection of ambiences; the library includes exploits with bottles, mirrors, marbles, glasses, shards, and more. Synthesizers: The Synthesizers collection is designed to harness the varied sonic palettes and possibilities of classic synths. From the vintage modulars to modern masters, the Synthesizers library spans a wide range of both musical and chaotic sources. Try creating monster stacks from an ARP 2600, a Moog Modular, an Oberheim Eight-Voice and an EDP Wasp. Start experimenting and you’ll find everything from traditional oscillators to lush effects; glitchy rhythmic syncopations to fat bass sounds. Toys: Childhood sounds can be full of hope and sunshine—or they can be the eerie stuff of horror-filled nightmares. The Toys library embraces both perceptions, resulting in a playful collection of child-like sentiments that can sometimes leave you screaming in the dark. Featuring a broad variety from children’s instruments to a circuit bent Speak & Spell, the Toys sound library possesses many possibilities for both soundtracks and sound design. Voice: The Voice library melds the world of incredible spectral manipulation with the most powerful instrument there is—the human voice. From simple solo voices and choirs, to beatboxing, hooks, and vocoded rises, Voice is dark, ominous, cheery, and wonderfully musical all at the same time. Breathe a human—or animal—element into your synthetic stylings with Voice. Ableton Live 8 and 9, Logic Pro X, Pro Tools, Cubase, Nuendo, FL Studio, Bitwig, and many more.